One of the best things about living in the Bay Area how a change of pace (or view) is just a drive away. 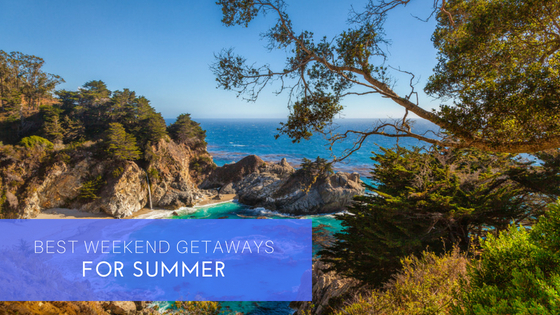 Whether you want to escape to wine country, beaches, or be dwarfed by the redwoods, there are plenty of scenic gems that can be enjoyed in endless weekend getaways or even day trips. Summertime is the perfect time to escape our daily routines and venture out to enjoy all the Bay Area has to offer. Here are some of our favorite local destinations you can enjoy this weekend! We want to note that we calculated drive time from central San Francisco. The prestigious Napa Valley Wine Country is a big draw for tourists and locals alike, attracting food and wine lovers from around the globe. Whether you spend the weekend wine tasting at one of the many wineries in Napa or Sonoma Valley, sampling local cheese, olive oil or baked goods, or relaxing at a spa, there’s something for everyone, even families. Monterey and Carmel-by-the-Sea are neighbors, meaning you can easily enjoy both towns in a single weekend. You can visit the Monterey Bay Aquarium, rent a kayak or paddleboard and meet some of the Monterey Bay residents, or rent a bike and bike the scenic Coastal Trail, or take a stroll down Cannery Row and Fisherman’s Wharf. Point Lobos State Reserve and Borromeo de Carmelo Mission should also be on your list of places to visit. If you love scenic drives, a trip to Big Sur should be on your list. One of the best parts of Big Sur is the impressive jaw-dropping scenery. You’ll get to experience redwoods, coastal views, cliffs, mountains, waterfalls, beaches, hiking, camping and more. Camp at Pfeiffer Big Sur State Park, catch a glimpse of the McWay Falls at Julia Pfeiffer State Park, or pick a hike (seriously, you can’t go wrong!). If you’re looking to slow down for the weekend, San Luis Obispo is just for you. Located right along the coast, SLO offers plenty of chances for beach activities and water activities like kayaking, surfing, and even horseback riding. You can immerse yourself in nature on one of the many hiking trails or sip a glass of wine (or two) in the Paso Robles and San Luis Obispo wine country. While Lassen Volcanic National Park may not get the same attention as its sister park Yosemite, it’s one of the oldest national parks in the United States. It’s one of the only places you can see all four types of volcanoes (cinder cone, composite, shield and plug dome) in one place. There are also over 150 miles of hiking trails, hydrothermal areas like the Sulphur Works and Bumpass Hell to view plopping mud pits and steaming vents, and more.